Backup point guards share the spotlight with the hottest scorer in the NBA when the Indiana Pacers visit the Charlotte Hornets on Wednesday night. The Pacers arrive in town riding a three-game winning streak, all at home. But they’ve also been hot on the road, rebounding from an 0-2 start to win five of their last six. Indiana closed its homestand with a 121-94 win over Utah, managing the blowout without leading scorer Victor Oladipo, who sat out with a sore knee. He remains questionable for Wednesday’s game. The Pacers counted on their depth in Oladipo’s absence, getting double-figure scoring from three reserves, including point guard Aaron Holiday. The rookie from UCLA never got off the bench in 10 of his first 15 NBA games but used 12 points in 15 minutes Saturday against Atlanta to get a season-best 21 minutes in the game against Utah. He accomplished a lot in his additional playing time, contributing 19 points and seven rebounds. Pacers coach Nate McMillan explained after the loss to Utah that Holiday had been the 10th man in a nine-man rotation earlier in the season. Oladipo’s absence created an opening Monday, one that may or may not be available again against Charlotte. But that doesn’t mean McMillan will bench his new hot hand. “I think that kid has earned the right to be out on the floor,” the coach told reporters. “He’s waited. He’s been patient. The Hornets will look to wrap up an eye-catching homestand with a second straight win in their first meeting of the season with the Pacers. Charlotte has split the first two games of the homestand, falling to Philadelphia 122-119 in overtime despite a 60-point explosion by Kemba Walker, who then poured in 43 points two nights later in a 117-112 win over the Boston Celtics. In the process, Walker has taken over the NBA lead in scoring at 29.6 points per game. While most people were gushing over Walker’s encore performance Monday, Hornets coach James Borrego insisted his backup, Tony Parker, deserved much of the credit for the win. Playing alongside Walker at times, Parker hit two critical late hoops in the win as part of a seven-point performance off the bench. Walker hit 14 of 25 shots, including 7 of 13 from 3-point range, to account for his 43 points. That came in the wake of a 21-of-34 overall and 6-of-14 effort on threes during his 60-point night. Walker had a 41-point game last February in a home win over Indiana. 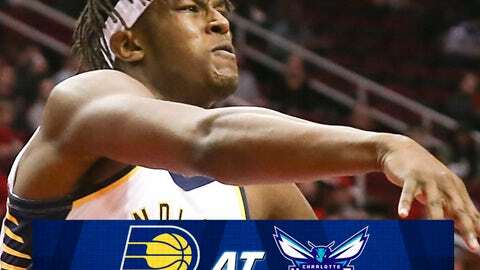 But the Pacers made adjustments in the rematch, limiting him to 12 points as Indiana snapped a four-game losing streak on the Charlotte court.